In December, new housing construction dropped 8.2 percent to the lowest level in more than a year — a piece of unwelcome news for economists, real estate professionals and buyers looking for a reprieve from home prices that have risen to all-time highs. It’s a no-brainer that new residential construction is the key to slowing home price growth, but how can big coastal cities that have borne the brunt of appreciation make the space for the construction so desperately needed? 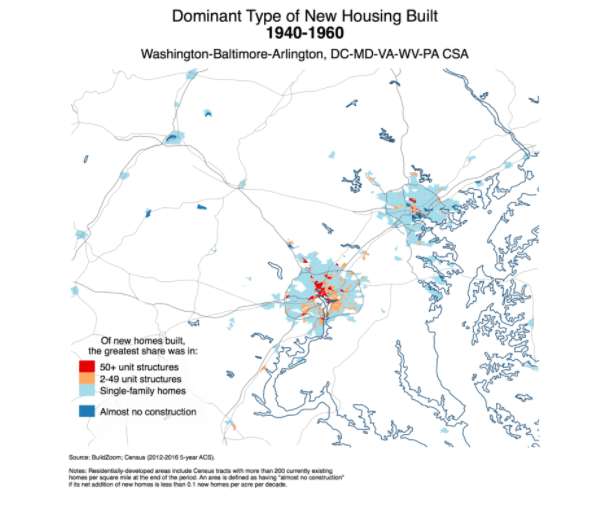 In his latest report, BuildZoom analyst Dr. Issi Romem suggests that cities shift some of their focus from dense pockets of development around transit hubs and corridors and begin gradually redeveloping low-density suburban areas to include a mixture of single-family homes, duplexes and small apartments, which would increase inventory and bring down home prices. To illustrate his point, Romem tracked residential building patterns in Los Angeles that showed a movement from healthy construction pace over a “vast majority” of the metro area in the 1940s to 1960s, to pockets of dense construction in the 2000s. Since the 1940s, Romem says dormant (or low-density) suburban areas went from being non-existent to accounting for 52.5 percent of Los Angeles’ residentially-developed footprint, which only accounts for 10.3 percent of new homes. On the other hand, the pockets of dense construction, which went from being non-existent to accounting for 4.5 percent of Los Angeles’ residentially-developed footprint, account for 13.8 percent of new homes. Romem says this pattern can be seen in cities across the nation, such as Boston, New York, Seattle and Washington, D.C., that can no longer expand outward. 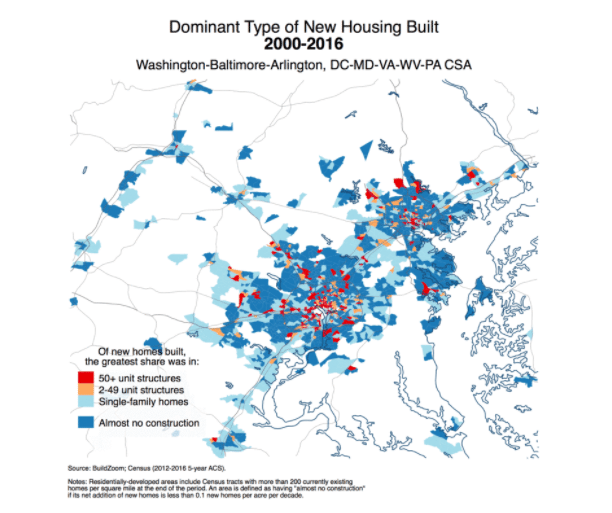 Meanwhile, there are other cities, such as Atlanta, Dallas, Las Vegas and Phoenix that continue to expand and use that extra space to build sprawling sub-divisions full of single-family homes. In order to take advantage of these low-density spots, Romem says cities will have to rethink and revise zoning and local land laws that make it difficult to build new housing. “In order to nurture new residential development in the dormant suburban interior, local land use policy would need to undergo a revolution,” he wrote. Part of that revolution, he says, hinges on loosening local control over development, which would make it easier to get funding for small-scale infill development (structures with less than 50 units). He also says loosening local control would allow residents outside the immediate area who would be impacted by the new construction to have a say in the process. “In general, more local control over development is detrimental to densification. The opponents of development tend to be concentrated locally, while those who stand to benefit from it tend to be widely dispersed and unaware,” he wrote. “The beneficiaries are generally non-local, yet local control implies that only local residents have a say, resulting in less development than would obtain if everyone affected by it had a say,” he added. Lastly, he says cities must recognize their housing shortages aren’t necessarily because they don’t have the space or resources to build. It’s because of a lack of awareness.